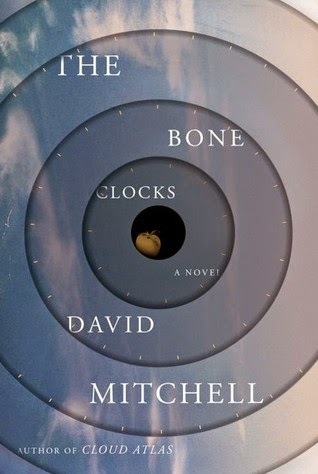 The Bone Clocks by David Mitchell is available at Amazon, Barnes and Noble, and BooksAMillion. A Cambridge scholarship boy grooming himself for wealth and influence; a conflicted father who feels alive only while reporting from occupied Iraq; a middle-aged writer mourning his exile from the bestseller list—all have a part to play in this surreal, invisible war on the margins of our world. From the medieval Swiss Alps to the nineteenth-century Australian bush, from a hotel in Shanghai to a Manhattan townhouse in the near future, their stories come together in moments of everyday grace and extraordinary wonder. I love Mitchell's writing; the man certainly knows how to turn a pretty sentence. This book is formatted similarly to Cloud Atlas, with six nested parts that collaborate to move the plot forward, and what I stated in my review of Cloud Atlas holds true for this book as well: when you think of this book in outline form, mind-boggling. Then, that outline gets weighted down by words. And I felt the weight of this book even more so than I did with its predecessor. I started out high on Holly Sykes in A Hot Spell. I fell absolutely head over heels into the first part of this book. Then, I hit the second part of the book, Myrrh is Mine, its Bitter Perfume, and that crush ended fast. Juxtaposition is the only reason I can come up with to explain such a droll section. I read A Hot Spell in one day but it took a week to get through Myrrh is Mine, its Bitter Perfume because I despised the main character, the pretentious narcissist Hugo Lamb (after this section, I returned to the schedule of reading one section per day). I briefly wished that I could pop into the story just to slap Lamb around a couple times. And by slap, I mean palm strike to the forehead with enough shoulder-backing to throw the little d-bag back on his egotistical behind. I celebrated reaching the end of this section. Seriously, I sprung for expensive craft ale. The third and fourth parts, The Wedding Bash and Crispin Hershey's Lonely Planet, dragged with verbose meanderings that wander off-point and convey small amounts of information pertaining to Holly. The future that's coming later in the book is set up here, with Mitchell showing readers what parts of the real world shape his future world. But, half the fun of a fantasy is the escape from the mundane real-world and it's the lengthy delivery of these details that matters after finishing the next two sections, An Horologist's Labyrinth and Sheep's Head. Especially Sheep's Head, set in the year 2043, which has a back-story chock full of all kinds of amazing events that we never read about because Mitchell chose a brief telling of events during conversation rather than showing us - which wouldn't bother me if the third and fourth parts had been delivered in the same manner. However, I loved the way Mitchell ended this book. I even like the way he wrapped up Hugo Lamb; it felt like an apology for making me want to hit Lamb so bad. I received a free advanced reader's copy of this book from First Reads in exchange for a review.